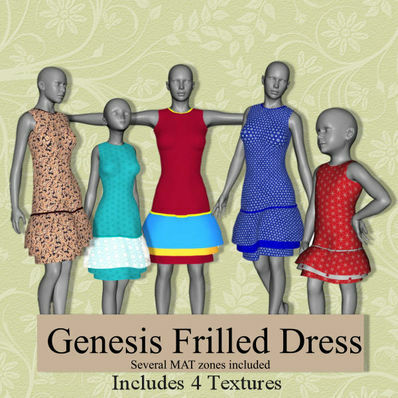 A frilled dress for Genesis for use in Daz Studio 4. This is my first item that I have modelled for Genesis. It's not perfect by any means, but will work with most poses and shapes. Any problems please let me know. There are several MAT zones included so you can change colours easily, plus you can hide some of the frills if you want to. I have also included 4 Textures. Thank you for your site! Soon I am going to try Daz! What a darling dress, thank you for the textures and those wonderful MAT zones. Apparantly the wrong item was zipped up in this file, so it has now been updated with the correct file.